MUSLIM FOOTBALLERS OFFEND GAY TEAM……. – The Tundra Tabloids……. 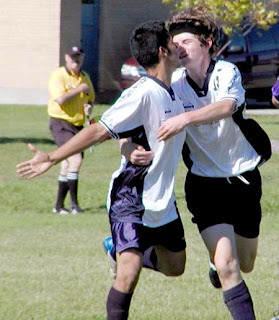 MUSLIM FOOTBALLERS OFFEND GAY TEAM……. PARIS (AP) – A French gay soccer team says its members were victims of homophobia when a team of Muslim players refused to play a match against them. The Paris Foot Gay team says Tuesday it received an e-mail from the Creteil Bebel club canceling a match scheduled for last Sunday. Previous Post Previous Post MARK STEYN AND EZRA LEVANT SPEAK BEFORE COMMISION ON FREE SPEECH AND HATE SPEECH LAWS……. Next Post Next Post CANADIAN TV INTERVIEWS KURT WESTERGAARD AND LARS HEDEGAARD…….